Convert more of your website visitors into customers by providing them with instant quotes for your conveyancing services. Configure your fees, disbursements and searches for each type of transaction. Quotation based on property location, tenure, property value. Add additional questions or options and coonfigure additional fees if selected. Fully customisable text and style on the web pages and in customer emails. 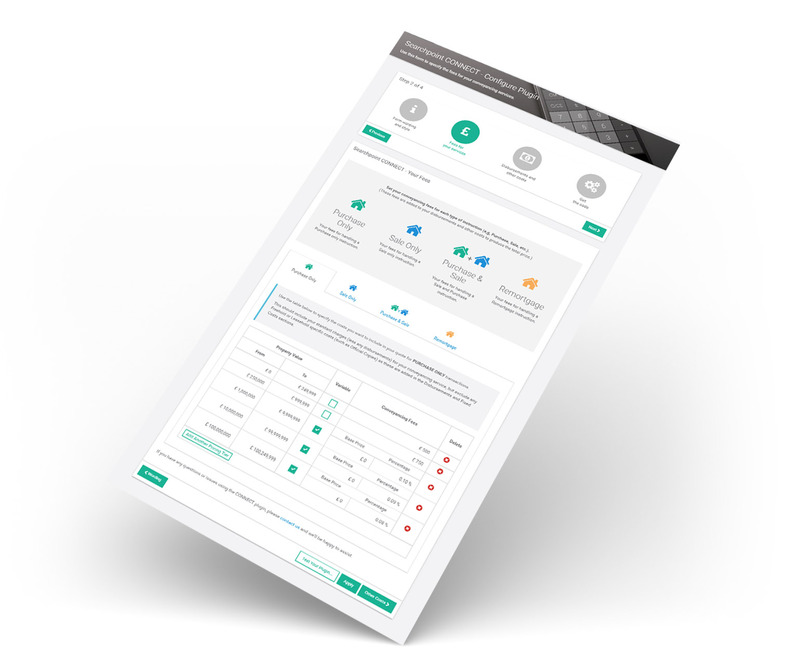 Full management dashboard with customers’ contact information, full quote details and opportunity tracking. Searchpoint CONNECT is completely free, there are no monthly or annual fees, no referral fees or transaction charges, and no setup costs. You can add the Searchpoint CONNECT quote calculator to your website with a single line of HTML code. Separate Sales and Purchase fees with a optional discounts for ‘Purchase & Sale’ transactions. Additional costs are now on one page with a simple matrix grid to allocate the cost to a transaction type. All costs, and how they are allocated, can be seen at a glance. Automatically inserts your name, email address, telephone number, company name and logo into email signature. Get up and running quickly with a simple, single line of code to add to your website. Quotes are now easier to read. The quotes are now organised by transaction type i.e. Sale and Purchase quotes are shown separately. All prices are shown excluding VAT, including your fees, searches and other costs. VAT is totalled and shown as a separate cost. Additional costs such as Stamp Duty and HMLR registration fees are grouped together in one section. Clear, accurate quotes that reflect well on you. Potential clients can now obtain the quote on screen without entering their personal details. Should they wish to have the quote emailed to them they are asked to supply their email address. If they request the solicitor to contact them they are asked to supply their name, phone number and email address. 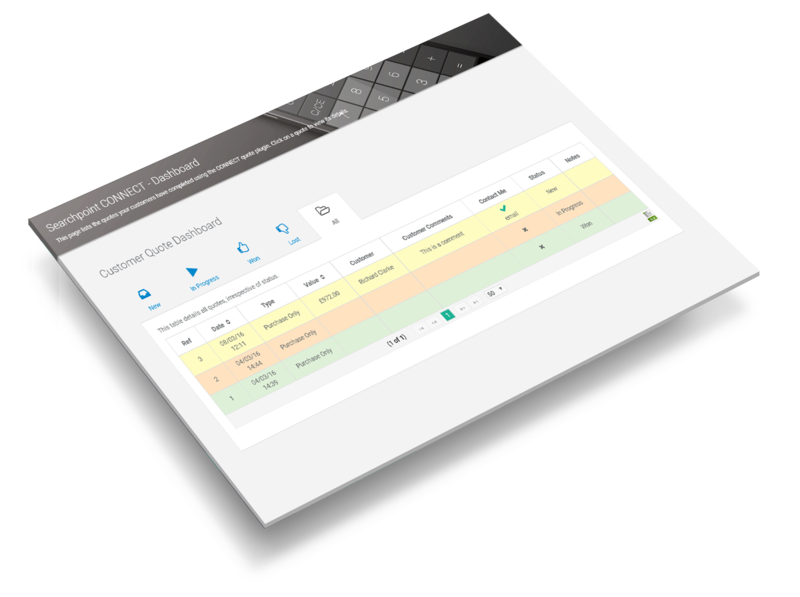 Your dashboard will show all quotes that are requested and whether the client has requested you contact them. The quote has your firms name, contact details and logo on to clearly identify your firm. The email is now sent from a generic email address ([email protected]) to avoid SPF issues. There is an option for you to have the “from” field as your own email address (additional anti-spam step recommended). All emails are copied to your ‘notification’ email address, so you know exactly what was sent to your customer. Searchpoint CONNECT Quote Calculator can be added to your website with a single line of code. To see what it looks like, we’ve created a simple demonstration page.